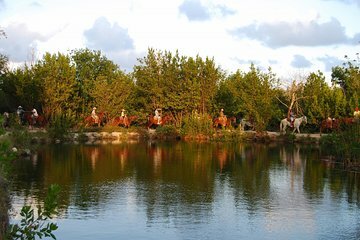 Take a break from crowded beaches on a horseback ride through secluded natural landscapes in the Riviera Maya. Going with a guide ensures you never get lost, as well as learn about flora and fauna you may not recognize along the way. For your convenience, snacks and round-trip transport are included. Destiny our tour guide was excellent but the tour was not 100t as described. Yes we traveled along the mangroves and had a slight view of the beach but we did not ride on the beach, nor did we ride through the jungle as the description said we would. We for a portion of the ride along the back of the complex and saw at times piles or rubbish and tired workers digging trenches. It was not the scenic tour we signed up for and not what I would have allocated 2 hours of my vacation plus transportation time for.